The American Civil War, also referred to as the War Between the States, is the most researched, written about and material collected compared to any other historic event. Over 150 years later, the story of that war with brother against brother, captures everyone’s interest, especially in reference to genealogical research. If any branch of one’s family tree were in the United States during the early 1860s, they were affected somehow by that war. Approximately 620,000 soldier deaths and an undetermined number of civilian casualties occurred during the war. Even more fascinating is to locate an ancestor who was in the military service during the war. Due to such great interest there are many resources available. Unless, already known, a researcher needs the ancestor’s name, which side they served and the state from which they served. With more than 6 million names on file, the ‘Civil War Soldiers and Sailors System’ on the web site is an excellent starting point. There are records for soldiers and sailors from the Union and Confederate sides. The site is maintained by the National Park Service, with the muster rolls as the main source of information. Included will be the soldier’s name, their rank, which side they served on, whether they were in the infantry or cavalry and the name of the soldier’s regiment and company. Once a researcher has the right ancestor with the regiment he served with, the Civil War Soldiers and Sailors System also has information on battles, regimental histories and cemeteries where soldiers were buried. Their site on general information about the Civil War will provide details of major events during the conflict. Another database the National Park Service has related to those who were held as prisoners of war. The site can be searched using the ancestor’s name. Each of the states having soldiers who participated in addition maintain listings of military enlistments and service records. Those records would be held by the state’s archival departments and copies of records can be requested or many of the records have been digitized by the states and appear online. It can be confusing, to know for sure which state an ancestor served with during the war. It may not have been the state they were a resident in because of that state’s position in the war. This was especially true with the border states, like Maryland. It officially remained loyal to the Union, but about half its citizen were Confederate followers and half Union supporters. If an ancestor was from Maryland and supported the South, they may have served in the Virginia Confederacy Army. When researching ancestor’s name, be aware the spelling of the surname could be different on their military records. For example, the family name of Wagoner, might have been written on the service records as Wagner or Waggoner. A great source on Civil War ancestors are the military pension records. Pension records contain a good deal of details of their military service and especially information after they left the service. Several of the Confederate states issued pensions until 1959. Those pension files are in the individual state archives in the state in which the soldier retired. Union pensions and Confederate pensions issued after 1959 can be found by writing the National Archives and Records Administration. To obtain pension record copies a NATF Form 80 must be requested, filled out, and submitted before records can be researched. Include the veteran’s name, Civil War Union or Confederate service, branch of service, and the state from which he served. After the National Archives and Records Administration research for the pension files, they will let the researcher known the copy fees, which must be paid before the copies are sent. Requests can take several weeks to be fulfilled. If the ancestor never applied or their widow never requested a pension, there will be no records. Instead, write to the National Archives for copies of the soldier’s full military records. The data is not as much in the military service records as a pension file. Another location to help confirm the regiment an ancestors served with is the obituary. A family member who provided the information for the published death notice may have included such details about their military service. Newspapers from the local residence may have articles about organizations of Civil War veterans; their meetings, participation in parades and reunions. An interesting Internet site to check is the listing of Soldiers during the Civil War who received the Medal of Honor. In alphabetical order by surnames are those who received this high national award. It was created in July 1862. These citations highlight the acts of bravery and heroism of many Civil War soldiers and sailors. It was a show of appreciation for gallantry and intrepidity at the risk of his life above and beyond the call of duty while engaged in an action against any enemy. 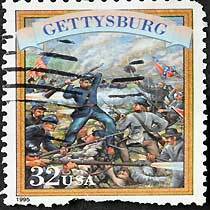 A total of 1,522 Union soldiers-sailors were awarded during the Civil War. Some 25 to African-Americans who served.